Chicago differs greatly from Miami, Las Vegas, and Los Angeles, in that you’ll be hard-pressed to find centrally located pools—especially outdoors—at hotels. While the city offers a number of indoor and outdoor neighborhood pools through the Chicago Park District, it’s not the same atmosphere as when you’re on vacation and looking for something more exclusive. 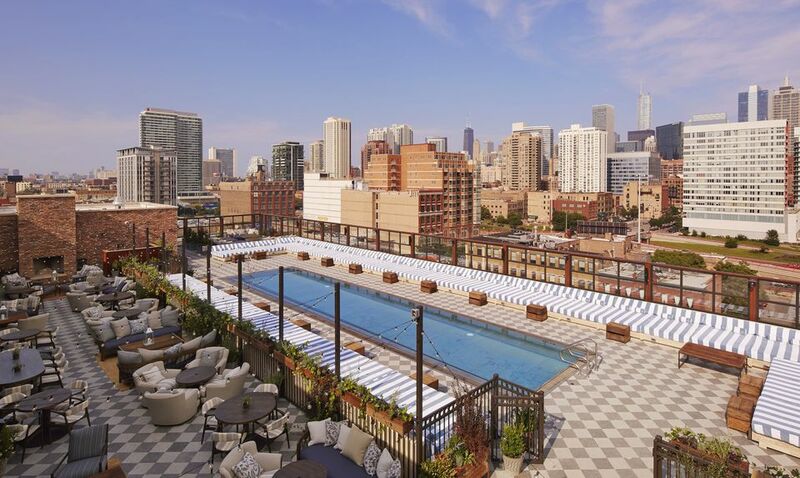 From family-focused Olympic-sized pools to grand rooftop pool offerings, there are many exciting places in Chicago to go swimming. The Four Seasons Hotel Chicago's 50-foot swimming pool may remind you of Hearst Castle in San Simeon California, with its Roman-style columns and glass domed ceiling with gold inlay. For a fee, private couples swimming is available after hours—plan the perfect date in the lap of luxury (see what we did there?). In addition to a top-floor spa and a fitness center with floor-to-ceiling windows, The Peninsula Chicago has one of the best swimming pools in the city. Located on the 19th-floor, with stunning views of Lake Michigan, this indoor pool is a place to not only get a few laps in, but also relax and rejuvenate. After a dip, sun yourself on the outdoor terrace and flip through a magazine—you'll want to stay here all afternoon. Chicago residents can indulge in a membership and enjoy the facilities all yearlong. Well-known as one of the most luxury-driven hotels in Chicago, The Ritz-Carlton, of course, has one of the best swimming pools in the city. Definitely check out their fitness center and rooftop yoga. Children are given child-sized bathrobes and special amenities and there are spa treatments that the entire family can enjoy, side-by-side. The indoor pool is a great way to relax after spending time on the nearby Magnificent Mile, shopping, dining and exploring everything this city has to offer.